I am not really into nail polish but the past few weeks, I just found it nice to have colors on my nails. However, when I had to remove them already, I realized that we run out of nail polish remover at home. I had to buy one as soon as I can because the polish already looked ugly. lols. I had second thoughts at first whether I should buy this one or the regular nail polish remover. Why? The regular polish remover is just 20php+ while this one costs 60php+. However, when I read the label that says Yuka Nail Polish Remover Wipes is acetone-free, I decided to give it a try. 1. Take out one piece and rub it against your nails until polish is removed. 2. Close the container tightly after every use. 3. Wipes can still be used even if not as moist as before. When I used the wipes, I noticed that it effectively removed the polish on my nails. But, the wipes dry up quite faster than the regular polish remover. I had to use two wipes to fully remove the polish on both my hands. It's nice that they have a scented remover. At least, it would have the scent of strawberry after it has been removed. I'm intrigued on how this product works to remove nail polish as it does not contain acetone. I mean, what's the powerful ingredient there? Nice product to try. Ma-share nga sa misis ko. The price don't matter naman basta mas health-friendly naman. indeed very cute!! i am not so fond of scents as well. i dont even use any fragrances myself as it makes my nose itchy and also makes me feel yucky if im inside the aircon. this one is very useful if your like removing your nailpolish on the go! i am not into creams like this, will ask my mom or sister to try it! True for the acetone,I have asthma and acetone trigger my asthma once inhaled. IT is good to have wipes that is Acetone free, a little bit cheaper but it worth it. I've been too in love with nail art the past days. As traditional as it is, I only use acetone to remove my nail polish. 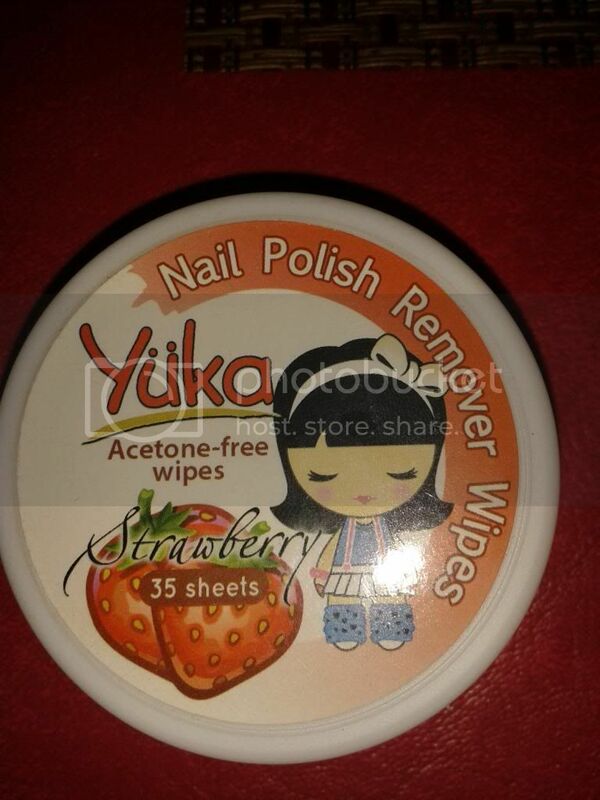 Never heard about this Yuka Nail Polish Remover Wipes, not until today. I would love to try! Agree with what Ms. Tess commented. I too have asthma and it really trigger if we smelled ACETONE. Good thing we have NAIL REMOVER wipes that is ACETONE FREE! Unique nail polish remover is Yuka. Not only a handy one, but a scented one. This is the first I know about this kind of nail polish remover. I am only familiar with acetone, then no more.